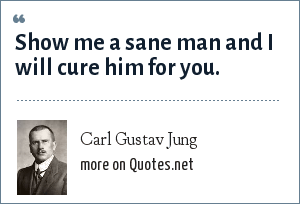 Carl Gustav Jung: Show me a sane man and I will cure him for you. "Carl Gustav Jung Quotes." Quotes.net. STANDS4 LLC, 2019. Web. 24 Apr. 2019. <https://www.quotes.net/quote/14621>.